We can professionally service and install any air conditioning system in your house to suit your needs. Even if you don’t have a furnace for central air conditioning, we can install an air handler, or a mini split system which is the most efficient way to cool your home. Your Air Conditioning system has routine maintenance requirements to perform at optimal efficiency and be safe. Any unit you rely upon should be checked by an expert at least once each year to know without question that all is well. By doing preventative care, you can save on utility costs and enhance the life expectancy of your HVAC system. We offer service agreements to make sure your tune up doesn’t get forgotten. We will contact you when your system is due for maintenance. Our tune ups include a professional cleaning, adjustment and safety check up that is performed on the entire a/c system to maximize safety and ensure that your system is running at its’ best. 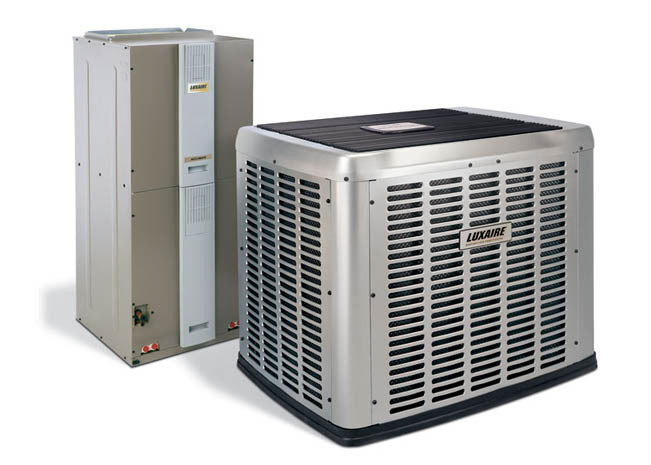 Luxaire heat pumps deliver four-season comfort in one stylish unit. They cool your home like an air conditioner in the summer, and warm it in the winter like a furnace. They are usually cheaper to operate than the gas furnace, offering a secondary heat source that is incredibly efficient. Contact Monticello Plumbing, Heating and Air Conditioning today for a free quote and long-lasting central air conditioning solutions. Uneven temperatures from room to room. Noisy operation…this could also be caused by undersized or cracked ductwork. Your system has to work longer and harder to achieve desired temperature. More frequent and costly repair problems. Whatever your reasons might be, count on the home comfort professionals at Monticello Plumbing, Heating and Air Conditioning to design and install the right system for you. In the process, we’ll perform a heat load calculation to determine how large of a system you need. We’ll also examine your ducts for cracks and leaks, and seal them up if possible.